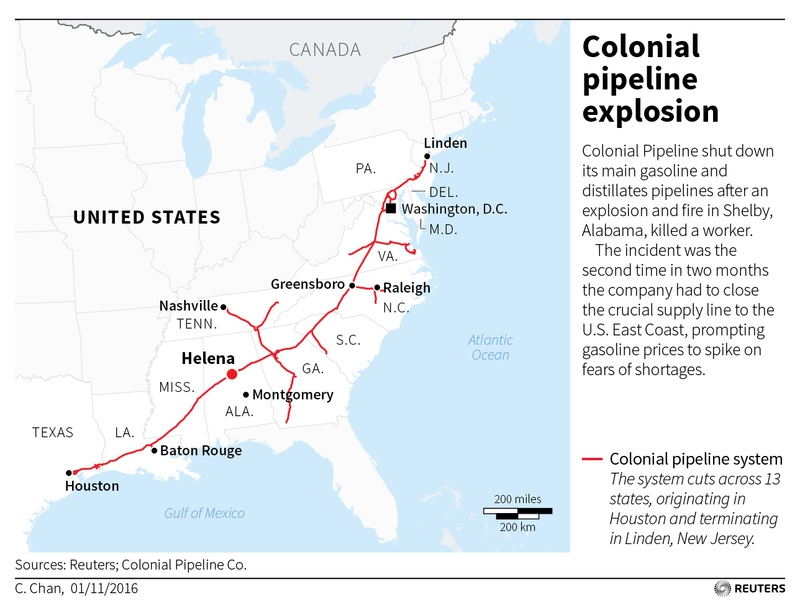 The outage on the Colonial pipeline, a 5,500-mile system that supplies gasoline, diesel and jet fuel to 13 states from Houston to New York, follows a Monday explosion and is the second shutdown in two months. Colonial’s pipeline [is the largest U.S. refined products pipeline system]. It carries 2.5 million barrels of fuel a day, supplying about 40% of the gasoline consumed on the East Coast. Colonial Pipeline Co. said it shut down its main gasoline and diesel pipelines after the incident Monday in Shelby County, Ala., about 35 miles south of Birmingham. Work-crew equipment struck one of the lines, causing a fire that killed one person and injured several others. 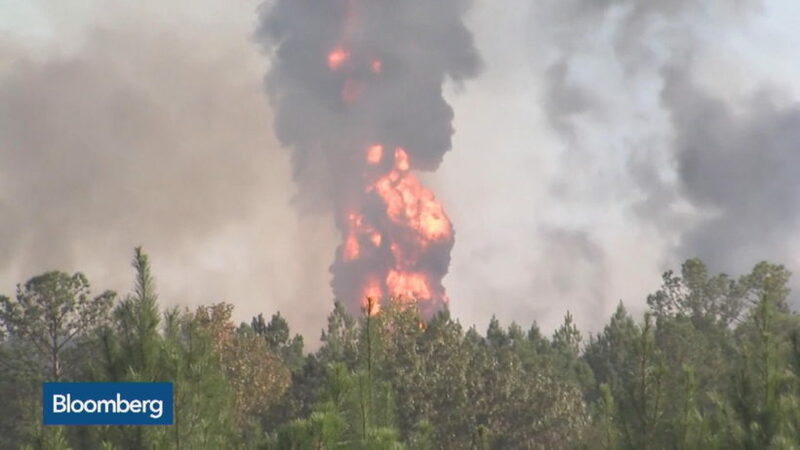 The explosion occurred several miles from the September leak. A nine-man crew working on the line in Shelby County hit Line 1, the main gasoline pipeline, with a large excavator known as a track hoe. Investigators said the contractors were “reportedly” working on repairs to Line 1 related to the September 9 pipeline leak. Colonial said it would work with shippers to send gasoline through the diesel line. 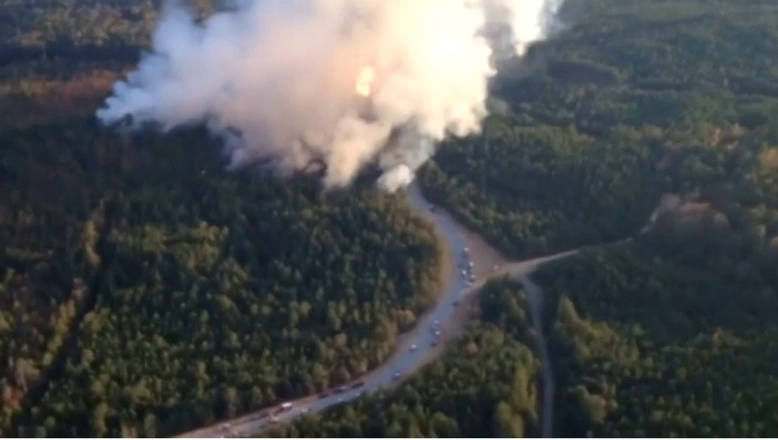 Monday’s explosion is the second major incident on the pipeline in recent months. In September, the company’s primary gasoline shipping route was partially shut after a leak of as many as 8,000 barrels was discovered in Alabama, a few miles from the site of Monday’s incident. The leak in the Colonial pipeline discovered in September caused a partial closure of the gasoline pipeline that lasted for 12 days. The East Coast has become more dependent on fuel deliveries from the Gulf Coast after refineries along the eastern seaboard have shut down in recent years. Kinder Morgan Inc.’s Plantation Pipeline carries some 700,000 barrels of fuel a day from Louisiana to the Washington, D.C., area. This year, Kinder Morgan halted plans to build a fuel pipeline from South Carolina to Jacksonville, Fla., amid local opposition and legislation in Georgia aimed at preventing the pipeline from being built. Traders and brokers have reported a flurry of interest in U.S.-flagged tankers, the only ones that can carry cargoes between U.S. ports under a 1920 law. But those vessels can be hard to come by. Kinder Morgan said Tuesday that its fleet is already spoken for. That leaves imports. Shipping rates on foreign tankers spiked Tuesday. Rates for oil tankers hauling fuel from Europe jumped 77% after Colonial shut down the pipeline on Monday, and rates from the Caribbean increased 50%, according to McQuilling Partners Inc., a shipping brokerage. While fuel inventories in the Northeast have replenished since Colonial’s last outage, Tom Kloza, global head of energy analysis at the Oil Price Information Service, said supplies are fairly tight in that region. “It exposes the flaws of a just-in-time inventory system for a lifeblood product,” Mr. Kloza said. 1. What is the Colonial pipeline? Be specific. 2. What occurred on Monday to disrupt flow from the pipeline? 3. What effect will this disruption have on customers who rely on it for fuel? 4. What is Colonial doing to minimize the disruption? 5. Describe the first accident with the Colonial pipeline that occurred in September. 6. Who will benefit from this second incident with Colonial in Alabama? “While fuel inventories in the Northeast have replenished since Colonial’s last outage, Tom Kloza, global head of energy analysis at the Oil Price Information Service, said supplies are fairly tight in that region. The reality is that fossil fuels (coal, oil, natural gas) are what give us electricity to power our air conditioners, computers, smart phones, video games, washing machines, clothes dryers et al, plus give us heat, running water and hot water, et al. Those believe that the use of fossil fuels is causing a looming catastrophe – global warming – insist the use of these fuels must be drastically diminished with the goal of eliminating their use. Those who don’t believe that the use of these fossil fuels is causing climate change – that change in the climate is natural / cyclical believe the government should allow fuel companies permits to build refineries, power plants and pipelines. a) What do you think? Do the accidents with Colonial pipeline prove that the use and transportation of gas, oil and diesel fuel should be reduced/eliminated even before it is replaced 100% by alternative fuel (wind, solar, water et al)? Define refinery. Do an internet search to find out why these refineries have closed, despite the ever growing demand for fuel.